Japan has a number of museums and exhibits dedicated or related to the Japanese emigration to Hawai'i, North America, and South America. They are listed below. Most of the museums have an interesting story behind them. I've visited most of them. If there is a museum or exhibit you know about and should also be listed here, please contact me with the info. Japanese Overseas Migration Museum in Yokohama. Japan's largest museum dedicated to the nikkei experience. A must-visit museum for all nikkei in Japan. There are permanent exhibitions explaining the immigration to Hawai'i, continental USA, and other countries especially South America. There are also changing or special exhibitions so it's worth visiting more than once. One recent special exhibition held from Dec. 2016 to Feb 2017 was titled, "Hawai’i's Nikkeijin Matsuri—Oshogatsu and Bon Dance" (photos here). Besides exhibition rooms, the museum has a reference library (closed on Sun.) with a collection of 20,000 books and materials about Japan's immigration. It even has kami-shibai (picture card stories). You can browse through recent Japanese novels such as "Japanese-Americans 99 Years of Love." The museum also has a restaurant with an outdoor terrace (open 11:30 am - 1:30 pm, 5:30 pm - 9 pm). The museum is operated by the Japan International Cooperation Agency (JICA) which is Japan's version of the Peace Corps. Unfortunately, their Web site is not in English (except for the map and directions), but there is a pamphlet in English which you can download here. Hours: 10 am–6 pm (enter by 5:30 pm), closed Mon. (open if a national holiday and closed on Tue. instead) and Dec. 29-Jan. 3. 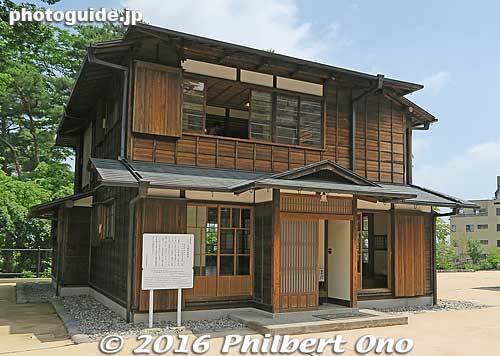 Preserved summer residence of Robert W. Irwin in Ikaho, Gunma (pictured at previous location). In the 19th century, Ikaho Spa was a popular summer retreat among the political and social elite. One of them was Robert Walker Irwin who spent his summers at his villa in Ikaho with his Japanese wife and children. Irwin was an American businessman from Philadelphia, PA who was later appointed by Hawai'i's King Kalakaua as the Hawaiian Minister to Japan. He negotiated for and oversaw the kan'yaku Japanese immigration to Hawaii during 1885-1894. 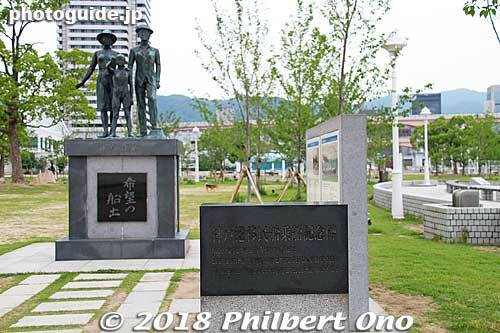 On Oct. 1, 1985, to mark the 100th anniversary of the Kanyaku Imin, the town of Ikaho in Gunma Prefecture designated Irwin's former summer residence as one of the town's Historical Places (伊香保町指定史跡) and proceeded to preserve the remaining part of the residence which was moved near the bottom of the Stone Steps. In return, Hawaii's Governor George Ariyoshi, a descendant of Japanese immigrants and America's first Japanese-American governor, sent a letter of appreciation to the town and people of Ikaho. The summer residence or villa (called Hawaiʻi Koshi Bettei ハワイ公使別邸 or Robert W. Irwin Bettei ロバート・W・アルウィン別邸) opened to the public as a history museum of the Irwin family and Japanese immigration to Hawaiʻi (free admission). It was only a small section of the original summer home. In autumn 2013, the home was moved to its current (and original) location slightly up the Stone Steps in place of the Kanzanso inn that was torn down. For the move, the building was disassembled and repairs were made where necessary. The home was then reassembled with new exterior walls, floors, roof, etc. In April 2014, a small, new museum called the "Guidance Facility" (ガイダンス施設) opened next to the Irwin summer home. Artifacts previously exhibited in the Irwin summer home were moved to the new museum. The new museum displays artifacts and exhibits related to the Irwin family and Robert Walker Irwin's role in the Japanese emigration to Hawaiʻi. Map here | Photos here. Directions: Map here. Located along the lower part of the Stone Steps in central Ikaho. Note that the museum moved to a new location in fall 2013, not far from the previous location at the foot of the Stone Steps. Hours: 9 am to 4:30 pm (enter by 4:15 pm). Closed Tuesdays and Dec. 28–Jan. 4. Entrance to ''Japanese Immigrants in the United States and the War Era'' exhibition in the National Museum of Japanese History in 2011. Opened in 1983, the National Museum of Japanese History is a large museum in a large park in the city of Sakura which is on the way to Narita Airport. It traces the entire history, archaeology, and folklore of Japan from the Stone Age. 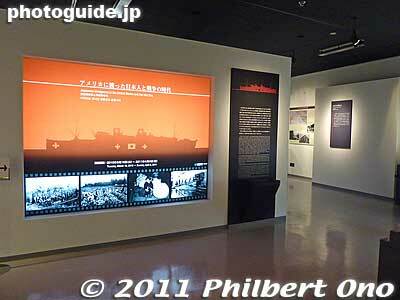 From March 2010 to April 2011, the museum held a special exhibition called Japanese Immigrants in the United States and the War Era (アメリカに渡った日本人と戦争の時代). The exhibition showed the impact of the war on the Japanese immigrants in the US, especially the Seattle area. The medium-size exhibition room had some artifacts from that era procured mainly from the Seattle area. The museum also held lectures inside the exhibition room and in the museum hall. An exhibition catalog is also available at the museum shop while supplies last. Although the exhibition is over, a visit to this impressive museum is worthwhile. Allow at least 2 hours in the museum or all day if you like to read everything. Directions: Take the Keisei Electric Railway to Keisei Sakura Station (approx. 55 minutes from Ueno; 20 min. from Narita Airport). Walk fifteen minutes or take a taxi for 5-min. ride. 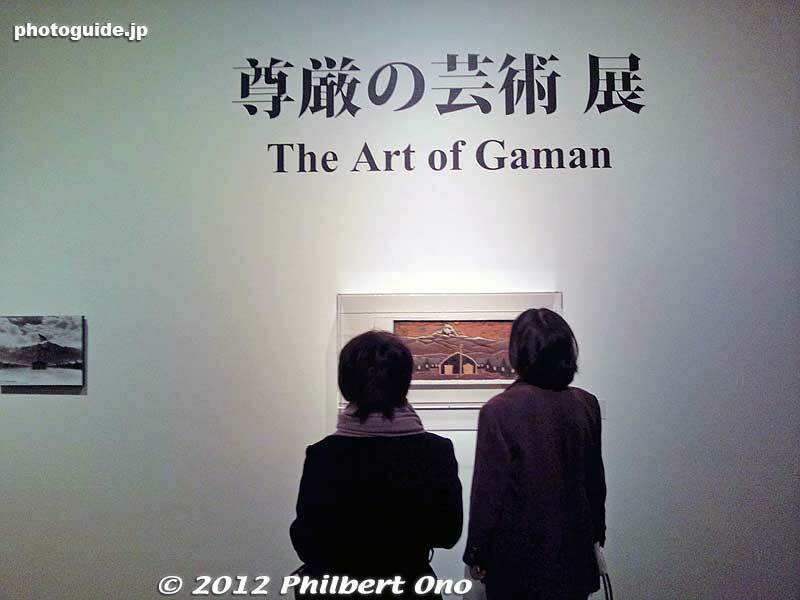 Entrance to ''Art of Gaman'' exhibition at University Art Museum, Tokyo in 2012. "The Art of Gaman" was an exhibition of art and crafts created by Japanese Americans incarcerated in Japanese internment camps in the US during 1942-46. They used whatever scrap materials they could find to create these very imaginative and intricate works of art. "Gaman" basically means "to endure hardship." 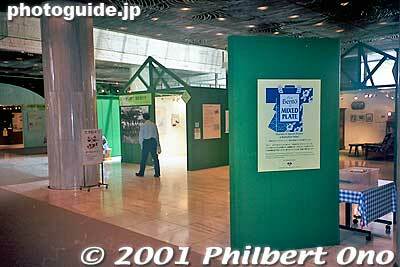 The exhibition was already well-known in Japan thanks to the NHK TV program "Close-up Gendai" which introduced it. It drew large crowds in Tokyo. After touring the US, including the Smithsonian American Art Museum in 2010, "Art of Gaman" toured Japan starting in Tokyo on Nov. 3 to Dec. 9, 2012. The show went on to Fukushima, Sendai, Okinawa, and Hiroshima where it ended in Sept. 2013. The University Art Museum, Tokyo University of the Arts is near Ueno Park in Tokyo. The exhibition in Tokyo was pretty much the same as the one at the Smithsonian American Art Museum. Directions: From Ueno Station, 15-20-min. walk via Ueno Park. Japanese Immigrant's Assembly Hall from Hilo, Hawai'i at Meiji Mura. Japanese Immigrant's Assembly Hall ハワイ移民集会所 - Originally built as a church next to Wailuku River in Hilo, Hawai'i at around 1889 by Okabe Jiro (岡部次郎), a Christian minister. It was built for the Japanese immigrants. After serving its time as a church, the building became an assembly hall for local Japanese Christians. Then it became a warehouse for a Hilo-based English newspaper called Tribune Herald. This was when the building was dramatically remodeled with the addition of a second floor. It was used until 1968. When the building was moved to Meiji Mura, it was restored to its original state based on old photos of the original building. The white picket fence around it and the small arch bridge leading to the front door were also reconstructed. It is now a simple, single-story rectangular building with only one room, looking more like a church. The Hawaiian flag and other things are displayed inside. One characteristic is the building's high floor, probably to avoid any high waters from the river and high humidity. Since it rains a lot in Hilo, it was often muddy around the building, so the small arch bridge was used to enter the front door. On the left of the building is a bell that was rung to wake up the Japanese laborers at 4:30 am, to start work at 6 am, to signal a 30-min. lunch break, and to end the 10-hour working day at 4:30 pm. The bell was a dreadful memory for the immigrant laborers. Japanese Evangelical Church シアトル日系福音教会 - Originally built around 1907 in Seattle, Washington as a residence for an American. It was built with mass-produced lumber, using the common 2x4 wooden construction. In the 1930s, the house was acquired by a Japanese immigrant after toiling long and hard for years. However, during World War II, the Japanese owner was forced to give up the house and move to an internment camp. After the war, the house was used as a church for the issei immigrants. 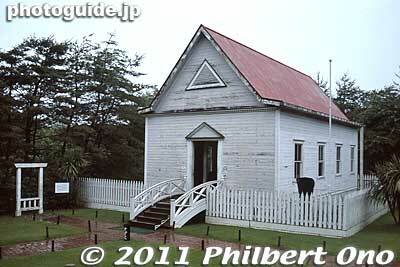 The church was later closed due to the dwindling number of issei members and was moved to Meiji Mura. It has been restored and you can see inside the small church. Japanese Immigrant's House ブラジル移民住宅 - The Japanese started immigrating to South America en masse from 1908 when immigration to the US was greatly restricted. In Brazil, they worked on coffee fields near Sao Paulo. During the peak immigration years of the 1930s, over 20,000 Japanese immigrated to South America annually. This house from Registro Sao Paulo, Brazil, was built in 1919 in a thick forest by Japanese carpenters. The locality's hard wood and Japanese-style construction were used. It even had a veranda on the second floor and Spanish-style roof tiles. A blend of Japanese and Brazilian construction. Hours: 9:30 am - 5 pm (closed 4 pm during Nov. to Feb.), closed Dec. 31, closed every Mon. during Dec.-Feb. (open if a national holiday and open on New Year's). Admission: 1,600 yen for adults, 1,000 for high school students (student ID required), 600 yen for elementary and junior high school students (free admission on Sat. ), 1,200 yen for age 65 and older (proof of age required). Annual pass (Nenkan passport) for unlimited entry available for 3,000 yen for adults, 2,000 yen for high school students, 1,000 yen for elementary and junior high school students, 2,000 yen for age 65 and up. Other info: Parking available. Pets are not allowed except for seeing-eye dogs. Pets can be kept in unwatched cages provided at the entrance. Baby strollers (200 yen rental) and wheelchairs (free) are available at the entrance. Bicycles, roller skates, etc., are not allowed. If time allows, visiting Inuyama Castle (National Treasure) from Meitetsu Inuyama Station is highly recommended. In Mihama town on Cape Hinomisaki, there was a small fishing village called Mio. In the late Meiji Period, stories of salmon riches in Canada's Fraser River lured tens of Mio residents to immigrate to Canada every year. After World War II, some immigrants returned home and built Western-style homes. There were so many exotic-looking Western-style homes that Mio village came to be called "America-mura" (American Village). The Canada Museum is a Western-style building exhibiting the immigrants' life in Canada and eventual internment during the war. Also displayed are items they brought back from Canada like a sewing machine and phonograph. The museum roof has a lookout deck affording a fine panoramic view of the coast and ocean. The museum is in Hinosaki Park in Mio where you can also find related monuments, Hinosaki Lighthouse, and the Hinomisaki Kokuminshuku Lodge (日の岬国民宿舎). Directions: From JR Wakayama Station, take the Kisei Line (紀勢本線) to JR Gobo Station (御坊駅), taking about 63 min. by regular train (950 yen) or about 40 min. by Tokkyu express train (1,890 yen). From Gobo Station, take the Gobo Nankai Bus (御坊南海バス) bound for Hinomisaki Park (日の岬パーク) taking 26 min. and get off at Hinosaki Park. Walk for 2 min. to the museum. Google Map here. Bento to Mixed Plate exhibition in 2001 at National Museum of Ethnology, Osaka. Huge national museum in central Osaka at the former site of Expo '70 in Suita, Osaka. Opened in 1977, the museum (nicknamed "Minpaku") is also a research institution for numerous researchers in ethnology. If you like foreign cultures, you should not miss visiting this museum. It has 255,000 items in its collection and about 12,000 of them are displayed. It is mind-boggling to see the diversity of human cultures. The museum library also has a collection of nikkei-related books. In 2001, the museum held the memorable From Bento to Mixed Plate: Americans of Japanese Ancestry in Multicultural Hawai'i exhibition which originated in the U.S. Directions: The closest train station is Banpaku-Kinen-Koen Station on the Osaka Monorail (15-min. walk from the station). From Shin-Osaka Station, take the Kita-Osaka Kyuko subway to Senri Chuo Station (13-min. ride) where you transfer to the Osaka Monorail. Get off at Banpaku-Kinen-Koen Station (6-min. ride). Detailed directions at their English Web page. Hours: 10:00 am -5:00 pm (enter by 4:30 pm), closed Wed., December 28 to January 4, and when there is bad weather. Admission: 420 yen for adults, 250 yen for high school/college students, 110 yen for primary and junior high school students. Free admission on Saturday for primary school, junior high school, and high school students. Special exhibitions may require additional admission fees. Kobe Port Emigrant Monument at Meriken Park. Formerly the Kobe Emigration Center (神戸移住センター) opened in 1928 where Japanese emigrants stayed before traveling mainly to South America (especially Brazil) by boat. It later was used as a school for hospital nurses. Today, it is a large, multi-purpose facility that includes exhibition rooms showing Kobe's history of Japanese emigration, especially to South America. Interesting reconstruction of the emigrants' sleeping quarters too. Also, art studios, art gallery spaces, and meeting rooms for cultural exchange (mainly Brazilian). 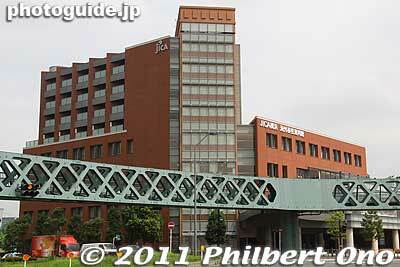 It is also a consultation center for South American residents of Kobe. Operated by the city of Kobe, the present facility opened on June 3, 2009. 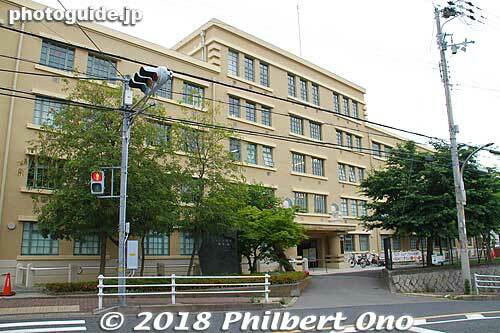 The center was used from 1928 to 1971 for emigrants (with a break during World War II) and it is Japan's only surviving building used for sending Japanese emigrants. Within a few months after the center opened, it was visited by Crown Prince Hiro and former Prime Minister Jun'ichiro Koizumi. In Japanese, the museum is called "Kobe-shiritsu Kaigai Iju to Bunka no Koryu Center." Directions: 15-min. walk from JR Motomachi Station (East Exit) on the JR Tokaido/Kobe Line. Walk straight along Koikawa-suji road (鯉川筋). Or 10-min. walk from Kencho-mae Station on the subway line. From JR Shin-Kobe Station (shinkansen), 10-min. taxi ride. Map here. Museum of Japanese Emigration to Hawaii.. Opened on February 8, 1999, the Museum of Japanese Emigration to Hawaii (Nihon Hawai Imin Shiryokan) is on Yashiro-jima island in the Seto Inland Sea off the city of Yanai (柳井市) in Yamaguchi Prefecture. It is slightly west of Iwakuni along the coast. The museum was converted and restored from a large, two-story, Japanese-style private residence donated by the family of Fukumoto Choemon for the museum. During the first nine years of the Kanyaku immigration program beginning in 1885, almost 4,000 of the island's 70,000 residents left the island to immigrate to Hawai'i. The entire island is called Suo-Oshima town (current population around 20,000) and does not go by the island's old name of Yashiro-jima. The museum shows a collection of artifacts related to the Japanese immigration to Hawai'i, how the immigrants faced hardship and eventual success, and cultural exchanges between Japan and Hawai'i. Hours: 9:30 am - 4:30 pm, closed Mon. (open if a national holiday and closed on Tue. instead) and Dec. 29-Jan. 3. Other info: Photography not allowed inside the museum. 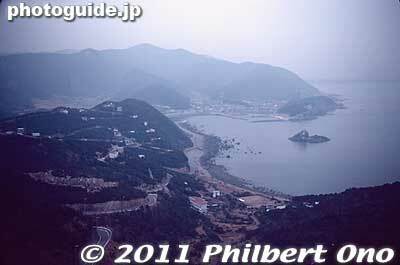 The island is quite large, the third largest island in the Seto Inland Sea. It is shaped like a goldfish and quite scenic, especially along the northern coast. A bus ride along the coast would be enjoyable. The island also has hotels and other accommodations. The largest settlement is around the bridge connecting the island to the mainland. More Suo-Oshima photos here. Opened in 1997, the museum claims that it is Japan's first museum dedicated to the Japanese immigration to Hawai'i. 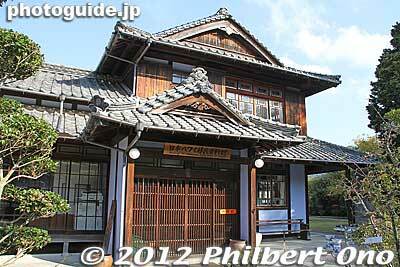 It is in a Japanese-style building formerly used as a storehouse (kura). The museum mainly exhibits things brought back to Japan by the immigrants who went to Hawai'i. It also explains the immigrants' lives in Hawai'i and why so many from Hiroshima immigrated there. Unfortunately, the museum is not open to the general public. It is geared for groups of school children visiting by appointment. However, if you call and explain that you are a nikkei from Hawai'i, they might accept you. The former Nihojima village where the museum is located has many families with ties to Japanese immigrants to Hawai'i. The museum director is Kawasaki Hiroshi, whose father immigrated to Hawai'i and worked as a steam locomotive engineer in the sugar plantations of Hilo, Hawai'i. Mr. Kawasaki has an older brother and four older sisters all born in Hawai'i and are American citizens. He is the only Japanese sibling, being born in Yokohama. During World War II, the family was split between Japan and America. He also had uncles and aunts who immigrated to Hawai'i and lived there permanently. One of Mr. Kawasaki's uncles became a successful carpenter in Hawai'i who started his own construction company. He sent money back home and had a new Japanese-style house and kura storehouse built, probably preparing for his return to Japan. However, he remained in Hawai'i where his kids were born and the estate went to his nephew Mr. Kawasaki. The large kura storehouse that was built is now the museum. The kura was a symbol of success and Nihojima village once had as many as 160 kura built by hardworking immigrants in Hawai'i and the mainland US who sent money back home. Directions: From JR Hiroshima Station, take the Sanyo Line train south to Mukainada Station (向洋駅), then take a taxi. Taking a taxi from Hiroshima Station is also possible. Google Map here. Admission: Free for elementary school groups. Other info: The museum is not open to the public. Elementary school groups can visit the museum by appointment. Japan has had a few high-profile TV programs and a few movies about Japanese Americans. However, these programs are for the Japanese audience and the cast always speak perfect Japanese. The main Japanese-American characters are also always played by native Japanese actors/actresses who just cannot speak English (or pidgin English) that well. We also do not see real Japanese-American actors/actresses in these programs so most Japanese Americans in Japan remain unconvinced. Sanga Moyu 山河燃ゆ - Year-long NHK Taiga Drama aired on NHK TV in 1984. The story followed the family of two brothers, one in Japan and one in the US before and during World War II. Starring Nishida Toshiyuki, Matsumoto Koshiro, Sawada Kenji, Ohara Reiko, Mifune Toshiro, and Agnes Chan. Based on the novel, Futatsu no Sokoku (二つの祖国) by Yamasaki Toyoko (山崎豊子). From Oregon, With Love (Oregon Kara Ai) オレゴンから愛 - TV series that ran for 13 episodes from Oct. to Dec. 1984 on Fuji TV. It followed a Japanese farming family who immigrated to Oregon and the story was told by the nine-year-old Akira writing letters to his sister back home in Japan. The popular series spawned an annual TV special until 1990 and two more times in 1992 and 1996. The series gave Oregon immense PR in Japan as it showed beautiful scenery of Oregon. Starring Furuya Ikko, Kinomi Nana, and Ishiwa Setsu. The haunting theme song was sung by Sada Masashi. Sakura さくら - Morning TV drama series that aired on NHK TV from April to Sept. 2002. The drama was about Sakura, a Hawai'i-born yonsei who had a sansei father and native Japanese mother. While still a student at the University of Hawaii, she works as an Assistant English Teacher at a junior high school in Hida, Gifu. Starring Takano Shiho and Nakamura Meiko. 99 Years of Love: Japanese Americans 99年の愛～JAPANESE AMERICANS～ - Mini TV series of five episodes aired by the Tokyo Broadcasting System (TBS) on November 3-7, 2010 to mark the 60th anniversary of TBS. It follows a family's immigration to America and their subsequent ordeals. Starring Kusanagi Tsuyoshi, Nakama Yukie, and Nakai Kiichi. Historically accurate, but an all-Japanese main cast means that they all spoke perfect Japanese. Toyo's Camera- Part of a trilogy by director Suzuki Jun'ichi. This movie is about internment camp photographer Toyo Miyatake. 442 - Live with Honor, Die with Dignity - Second film in Suzuki's trilogy. About the 442nd RCT. Military Intelligence Service - Human Secret Weapon - Last in Suzuki's trilogy, about the MIS. Includes interviews of Dan Inouye and George Ariyoshi. Go for Broke! - Memories of Hawai'i Japanese - Interviews of nisei war veterans in Hawaii. Directed by Hiroyuki Matsugen Matsumoto. Robert Walker Irwin - Hawaiian minister to Japan who supervised the Kanyaku Imin immigration to Hawaii. Japanese Cultural Center of Hawai‘i - Moiliili, Honolulu, Hawai'i. The facility has a permanent exhibition called, "Okage Sama De: I Am What I Am Because of You" showing the multi-generational history of the Japanese in Hawai‘i. Wakamatsu Tea and Silk Colony Project - Project to preserve the site of the first Japanese immigrants to America who came from Aizu-Wakamatsu in Fukushima Prefecture during the Boshin War in 1869. Also see California Rice Commission's support page and photos here. Japanese Canadian National Museum - Burnaby, BC, Canada. Nikkei Place - National Nikkei Heritage Centre and the Japanese Canadian National Museum in Burnaby, BC, Canada. Northwest Nikkei Museum - Dedicated to preserving the heritage and history of the Pacific Northwest’s Nikkei community. Run and operated by the all-volunteer Northwest Nikkei Museum Committee. Oregon Nikkei Legacy Center - Museum that is sharing and preserving Japanese American history and culture in Portland's Old Town neighborhood, where Japantown once thrived. JASC Legacy Center - Community-based archive and library that collects, preserves, and makes historical resources from the Japanese American community in the metropolitan Chicago area available for research and reference purposes. Japanese American Service Committee - Non-profit social service agency that works to promote the family and community through a wide array of programs and services. Hawaii's Plantation Village - Outdoor history museum of Hawaii's plantation-era homes. Step inside well-preserved examples of historical homes that various immigrants lived in, including Japanese immigrant homes. Waipahu, Oahu, Hawaii. Japanese American Museum of San Jose - In San Jose, California. From Bento to Mixed Plate: Americans of Japanese Ancestry in Multicultural Hawai`i - Major exhibition held at the Bishop Museum in Hawai'i, California, and Japan. Hawaii Okinawa Center - Home of the Hawaii United Okinawa Association in Waipahu, Oahu, Hawaii. Japanese American Citizens League - Working for the rights of Japanese-Americans. The Association of Nikkei & Japanese Abroad （財）海外日系人協会 (Kaigai Nikkeijin Kyokai) - Based in JICA offices in Yokohama. National Japanese American Historical Society - Based in San Francisco, California. Hokule'a voyage to Japan in 2007 - Celebration of Hawai'i-Japan ties by Polynesian Voyaging Society. Japanese Cultural & Community Center of Northern California - In San Francisco, California. Japanese American Community and Cultural Center - In Los Angeles, California. Nanka Kenjinkai Kyogikai 南加県人会協議会 - Association of kenjin-kai in southern California. English introduction to Nanka Kenjinkai Kyogikai. Honpa Hongwanji Mission of Hawai'i - Honolulu-based headquarters of 36 Jodo Shinshu Nishi Hongwanji temples in Hawai'i. Buddhist Churches of America - San Francisco-based headquarters of Jodo Shinshu Nishi Hongwanji temples in mainland USA. Jodo Shinshu Buddhist Temples of Canada - Vancouver-based headquarters of Jodo Shinshu Nishi Hongwanji temples in Canada. Federação das Associações de Províncias do Japão no Brasil (Kenren) - Association of Japanese-Brazilians. The Rafu Shimpo - Los Angeles-based newspaper for the Japanese-American community. Discover Nikkei - To connect with others and share the Nikkei experience. Project of Japanese American National Museum. Nichi Bei - Japanese-American News and Culture. Samurai of Gold Hill - Documentary project about the Wakamatsu Tea and Silk Colony by film director Brian Maeda. Hawaii Hochi - Honolulu-based, Japanese- and English-language newspaper. Japanese American National Library - In San Francisco, California. The only national Japanese American resource center dedicated to collecting and preserving primary and secondary source materials on Japanese Americans. World War II Internment in Hawaii - Resource site compiled by the Japanese Cultural Center of Hawai‘i. ＊ Contributors to this page also include Michael Takashita. This page was last edited on 12 April 2019, at 00:43.